WEST VILLAGE — A longtime Carmine Street bookstore will soon share its space with a new comics shop that will focus on serving emerging artists and feature illustrators working live in the store's front window. The independent bookstore Unoppressive, Non-Imperialist Bargain Books will begin leasing a portion of its Village storefront to Carmine Street Comics, after owners Jim and Indiana Drougas decided to a bring in a new tenant to replace the former mobile phone store there. As Carmine Street is forecasted as one of the Village's next hot spots — with retail rents to match — the 22-year-old store will sublet about half of its space to Carmine Street Comics. 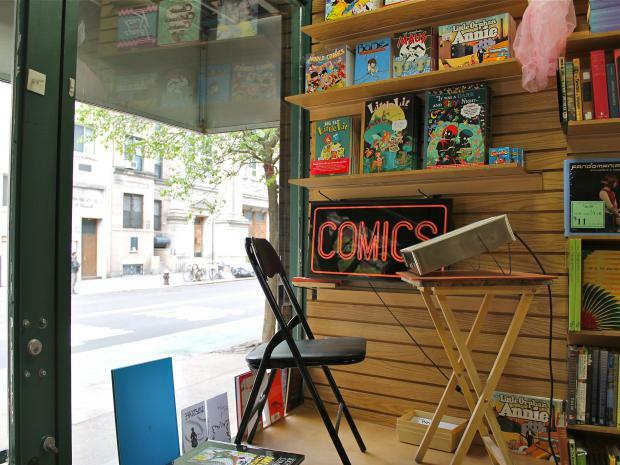 Two employees of the Madison Square Park shop Manhattan Comics & More are preparing to open the store, as the comics blog the Long and Shortbox of It first reported. "It's going to be open space for comic creators," co-owner Jon Gorga said Monday. Gorga, 26, his Manhattan Comics colleague Michael Novo, 24, and their business partner Michael McLeroy, 22, will welcome guest artists to work in the store's front window on a weekly basis, each for a few hours every day. Specializing in countercultural works at cut rates, the Drougas family sublet about a third of their small shop to MetroPCS starting in September, but the deal didn't last long. "Their customers had no interest in us, and vice versa," Jim Drougas, 62, said Monday, noting the phone company vacated the space at the end of November. As the end of MetroPCS's lease approached earlier this year, the book shop's owners were considering new ways they could cover their rent. Just in time, a longtime customer connected Drougas with the comics enthusiasts. Gorga said he thought the two-in-one store would work out well. "I think it's going to be an excellent partnership, because people are already aware of the variety available [at Unoppressive Books]." However, there will be less space to go around this time, as the landlord claimed a portion of the rear of the store for other use within the building, Drougas said. "The price is approximately the same, but we lost about 40 percent of the total space," he explained. Both parties declined to disclose how much they pay in rent. Drougas — whose family first sold books in the early '90s from tables set up outside the Little Red School House and Elisabeth Irwin High School — said he looked forward to working with Carmine Street Comics but admitted that continuing to run a business in a tight economy was a struggle. "The fact that we really have to get the comic book guys in to survive shows we can't really do this solo," he said. The comics shop is expected to open on May 1.